How Does Your Septic System Work? Septic system maintenance is an important part of home ownership. It can prevent property damage, heavy expenses, and a major headache. However, before you can understand how to maintain your septic system, you must first understand how your septic system works. Septic systems consist of two main parts: the septic tank and the drainfield. A septic tank is a large box or cylinder, usually made from concrete or fiberglass, which is buried underneath the ground. The drainfield is the area through which your septic pipes run; this is essentially the path from your septic tank to the sewer. What Does Your Septic Tank Do? Performs basic treatment of water. Sends treated water through the pipes in the drainfield. Water leaving the septic tank is called “effluent.” It is not fully treated after leaving the tank; however, the tank breaks down solids and separates grease, fat, and other contaminants so that the water can flow more smoothly through the pipes. 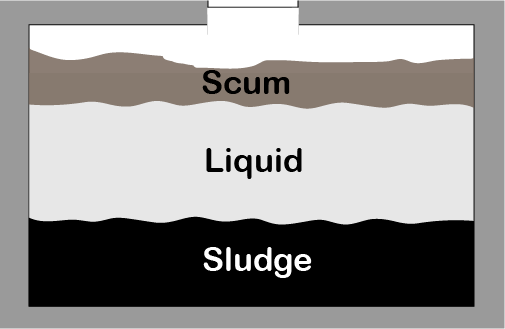 Over the course of time, septic tanks begin developing a layer of solids (or “sludge) on their floors and walls. Consequently, they need to be pumped every few years to keep them from overflowing into the drainfield and causing clogged pipes. It is important to schedule an annual inspection of your septic tank to ensure that it does not need to be pumped. What Does Your Drainfield Do? Directs water from the tank to the sewer lines. Uses organisms from landscape to treat water a second time. It is important to keep your drainfield clear. A flooded drainfield is a mess, and cars, buildings, etc. above underground pipes can lead to cracking and flooding. It is vital that every homeowner possesses a basic understanding of how their home works. Septic systems are no exception. Understanding your septic tank and your drainfield individually helps you understand your septic system as a whole. This can help you properly care for and maintain each component, saving time and money in the long run. Norway Septic Inc. is a service oriented company dedicated to providing excellent septic tank cleaning and septic tank pumping services to homeowners and business owners in the Michiana area. We take pride in doing the job that others leave behind. If you have further questions or if you would like to schedule a septic tank cleaning by one of our professionals, call us today. What is an Aerobic Septic System? How Often Should You Pump Out Your Septic Tank?